Aristotle was born in 384 BC in a Greek Town of Stagira, which was a seaport on the coast of Macedonia. As the ancient Greeks in Aristotle's time only had one name, they were often also referred to by their place of birth, hence Aristotle was commonly known as "Aristotle of Stagira". His father, Nichomachus, was a court physician to King Amytas of Macedonia, which provided Aristotle his long association with the Macedonian court, which later in his life proved to be a great influence. When he was just a boy of the age of 10, Aristotle's father died and he was taken under the care of a man named Proxenus. Proxenus sent Aristotle at the age of 17 to Athens, which was then the intellectual centre of the world, to complete his education. In Athens, Aristotle joined the famed Plato's Academy and began to be a prominent figure. In the later years of his time there he also began to lecture as well. When Plato died in 347 BC, it wasn't Aristotle that took his place, even though he was intellectually perfectly capable. Plato's nephew Speusippus was chosen to head the Academy because Aristotle's ideas had diverged too far from Plato's. Aristotle left the Academy and, at the invitation of his friend Hermeas, he left for the court of Atarneus in Mysia. Here he stayed for three years, where he married his first wife, Pythias, the King's niece. After three years the Persians invaded Atarneus, killing Aristotle's friend Hermeas, who was the ruler at the time, and forced him to leave for Mytilene. At the invitation of Philip of Macedonia, he tutored his 13 year old son Alexander, later to be known as the famed Alexander the Conqueror. Both Philip and his son respected Aristotle and gave high honour to him, funding his teaching and his own studies. Only a year later Aristotle died after complaining of a stomach illness in 322BC. Aristotle wrote a number of works, which themselves have an interesting history. When Aristotle died, they were kept by one of his students, Theophrastus, who also took over the school Aristotle was forced to leave when he fled from Athens. This extensive library of philosophical works was then handed down to Theophrastus' student, Neleus. Neleus's heirs concealed them in a vault to protect them from theft, where they were subsequently partially ruined by dampness and moths. In 100BC they were discovered by Apellicon, a book lover, who took them to Athens, and they later were taken to Rome after Athens was captured in 86BC. Here, Aristotle's works took the interest of the Roman scholars and this gave a fresh drive to the study of Aristotle and of philosophy. Aristotle's works come under three main headings; dialogues, collections facts by scientific methods, and systematic works. These works included logic, physics, natural science, metaphysics, politics, rhetoric, ethics and even poetry. ", eg: "All cows are mammals" and "No dogs are reptiles". The second premise is an example, like "This is a cow". The conclusion uses the first fact to reach an argument about the second premise. Therefore, this cow is a mammal. Aristotle's editors gave to the name "metaphysics" when he was first sketching out the history. Aristotle said that philosophy arose out of history after the basic necessities were secured. It grew from a feeling of curiosity and wonder, where the accepted religions and myths didn't give any satisfaction. As in Sophie's World 1 puts it into a context of a rabbit being pulled out of a magician's hat; "We who live here are microscopic insects existing deep down in the rabbit's fur. But philosophers are always trying to climb up on the fine hairs of the fur in order to stare right into the magician's eyes". The earliest of these "speculators" were the natural philosophers (Thales, Anaximenes, Anaximander), next came the philosophers who tried to solve things with mathematical methods, like Pythagoras. Pure thought and ethics were introduced and thought about by Socrates. Aristotle went further and for him the subject of metaphysics deals with scientific knowledge and the ultimate conditions of all existence. To be more specific, he dealt with existence in its most fundamental state. This contrasted to the mathematical thoughts of Pythagoras which deals in existence in geometry, but not existence itself. This is one of the reasons why Aristotle is often coined "the first scientist", as he was the first person to use scientific logic and thought processes to explain existence. In his arguments he says that there are a handful of universal truths, and he defends the laws of consistency, saying that rejecting them would be suicidal, and rejecting them would lead to the sameness of all facts. During his scientific explorations and exercises he produced his works on natural history, where he records his finds and conclusions about the whole world. In this, he was, in effect, doing the very first scientific research. Plato had made some astounding conclusions. He deduced that we were living in the "sensory" world where everything was like a gingerbread man product of the "ideal" product, the perfect product. He said that the "ideal" horse came first, then came all the sensory world's horses, which weren't perfect, as he explains in his famous Cave. In the famous question "What came first; the chicken or the egg? ", Plato answers that the "idea" chicken came before the egg and the chicken. Aristotle though Plato had it upside down. He agreed with his mentor that the horse doesn't change or "flow" and that all horses are imperfect and mortal, and he agreed that the basic form of the horse is eternal. But he argued that the "idea" horse is just a concept that humans had come up with after seeing a lot of horses. Aristotle said that the "idea" or, as he liked to put it, the "form" horse was made up of the horse's characteristics, which we call the species. In modern science, we have discovered deoxyribonucleic acid (or DNA), which we have found, controls the characteristics of every living plant and animal. This is the "form" horse that Aristotle was explaining. 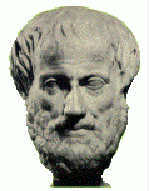 In Aristotle's works, he discussed causes in nature, in which he named four, but his main one was his "final cause". In this he asked "why" things happened, instead of the normal why. The natural philosophers were struggling on the notion of how things happened, while Aristotle was asking "why". In this, he is asking the general purpose of why things happen (which eventually boils down to the meaning of life). For example, we know that it rains because when moisture in the clouds cool, condense into water droplets and fall down to the earth by gravitational force. Aristotle agrees, but this explanation mentions only three of his "causes". The "material cause" is the moisture was there when the clouds cooled, the "efficient cause" is the process of the moisture cooling, and the "formal cause" is that the rain, by the laws of nature, must fall to the ground. This, however, misses his "final cause", which is why it rains, what is its purpose. In this he would turn it around saying, the plants on the ground need water to grow, which we need to eat or for our domesticated animals to eat. He would reach the conclusion that it rains so that plants can grow so we can eat them. Science today doesn't agree with Aristotle on this matter. It says that however that man needs the rain for the plants to grow, if it didn't we would survive, but this is not its purpose. People who believe in a God who created the world would insist that Aristotle may well have not been wrong, because viewed in the context of God creating the world it would naturally follow that rain was for man and the plants, God's creations. Aristotle is considered to be the first scientist, and he started off a revolutionary way of thinking, which has shaped our daily lives. Every thing we do and know in our modern way of life has something to do with scientific thought, which Aristotle first introduced. O'Flaherty, S (2000), Aristotle: The First Scientist [http://www.philosophy.sean.tripod.com].